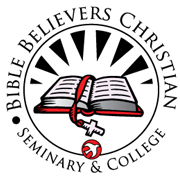 Bible Believers Christian College and Seminary was founded for the purpose of making a good, Bible-based education available to pastors and Christian workers who are not at liberty to leave their churches or jobs to attend a typical resident Bible College. The expenses incurred while attending Bible colleges and seminaries most generally reach into several thousands of dollars. Bible Believers Christian College and Seminary, Inc operates as a nonprofit institution. Students are charged no more than necessary to provide the appropriate Christian educational services of higher learning. Due to the changing economic conditions, the institution reserves the right to revise charges as deemed necessary. However every effort is made to keep the cost as low as possible. Bible Believers Christian College and Seminary offers interest-free payment plans, but does not participate in federal financial aid programs. A degree from Bible Believers Christian College and Seminary does not come easily. It is true that nothing worthwhile comes easily. You will be required to work hard and discipline yourself to earn a coveted degree from Bible Believers Christian College and Seminary, Inc. When you have completed the required course work you will have gained in-depth knowledge and wisdom in the truths of the Word of God. You will be better equipped to carry out the great commission the Lord Jesus Christ has given you.